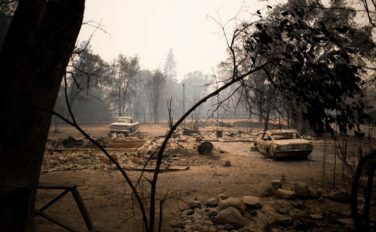 As wildfires ravage large swaths of California for a second year, one of the state’s biggest utilities has declared that it faces billions of dollars in potential liability — far more than its insurance would cover. The potential losses could leave the company’s customers on the hook to pay the bill, exposing businesses and consumers to higher costs. The utility, Pacific Gas and Electric Company, could even face bankruptcy, putting pressure on the state for a bailout. With its financial liabilities mounting, the company’s shares dropped by more than 20 percent on Wednesday. More than half of its market value has been wiped out since late last week as the fires have spread. Investigators have yet to determine the cause of the deadliest of the current blazes, known as the Camp Fire, which has killed at least 56 people and destroyed virtually the entire town of Paradise, about 90 miles north of Sacramento. PG&E disclosed in a regulatory filing on Tuesdaythat an outage and damage to a transmission tower were reported in the area shortly before the fire started last week. Many fires in recent years have been caused by downed power lines serving California’s utilities. State officials have determined that electrical equipment owned by PG&E, including power lines and poles, was responsible for at least 17 of 21 major fires in Northern California last fall. In eight of those cases, they referred the findings to prosecutors over possible violations of state law. Citigroup estimates that PG&E’s exposure to liability for those fires is $15 billion — and that it could face another $15 billion in claims if it is found responsible for the Camp Fire, a number that could rise because the fire is only a third contained. “The damages, if you add 2017 and 2018, obviously are going to be really significant,” said Praful Mehta, a Citigroup analyst. The compounding costs of the year-after-year wildfires are making it increasingly difficult for any party to absorb the expenses, said Mark Cooper, senior research fellow for economic analysis at the Institute for Energy and the Environment at Vermont Law School. If the utility is forced to increase rates sharply, the costs may take an economic toll. Manufacturing companies could choose to move their businesses out of the service area or even the state. Residential customers within the utility’s territory then could be left to cover the costs. PG&E said its liability insurance for the year that began Aug. 1 amounted to $1.4 billion. Lynsey Paulo, a spokeswoman for PG&E, said the utility was focused on helping fight the current wildfires rather than the company’s economics. The company has set up a base camp with 800 employees in the area of the Camp Fire, she said, a figure that is expected to grow to 1,000 by the end of the week and could reach 3,000. “We’re not going to speculate on what may or may not be impacting the stock market,” Ms. Paulo said. Critics of the utilities say poor maintenance of power poles and failure to trim vegetation around power lines is a major cause of fires. On a walking tour last spring in San Jose, a former state regulator showed overloaded poles bending under the weight of wires and cables, as well as power lines running through tree foliage. PG&E’s “safety culture” has been the subject of a three-year investigation by the state’s Public Utilities Commission. The agency is expected to act on the inquiry’s findings as early as this month. In addition to wildfires, PG&E was found at fault in one of California’s biggest disasters in this decade — a natural-gas explosion in 2010 that devastated the San Francisco suburb of San Bruno and killed eight people. PG&E was fined a record $1.6 billion by the state for failing to maintain its pipeline system properly, and paid $900 million to resolve lawsuits related to the explosion. As a pre-emptive measure to prevent wildfires, PG&E last month cut power to tens of thousands of customers as high winds prompted fire alerts in many areas, including parts of Napa and Sonoma Counties that were hit hard by fires a year ago. Shares of the parent companies of the state’s other investor-owned utilities — Edison International, which operates Southern California Edison, and Sempra Energy, which owns San Diego Gas and Electric — also dropped earlier this week as wildfires spread in both Northern and Southern California. The state’s power supply is not likely to be at risk, but PG&E could face bankruptcy if it cannot cover the liabilities it faces, wiping out shareholders’ equity and eating into bondholder investments. It has already been through bankruptcy once, in 2001, during an energy crisis after a botched deregulation effort. Legislators intervened this year to shield PG&E and the state’s other investor-owned utilities from overwhelming legal claims, allowing them to pass the expense on to ratepayers. But the law, Senate Bill 901, applies to fires beginning in 2019, and in some of last year’s incidents — not to this year’s fires. Paul Payne, a spokesman for Senator Bill Dodd, who sponsored the measure, said the bill was a response to the potential costs PG&E and its customers were already facing. “We were focused on 2017 and protecting the ratepayers from that fire,” he said. Some analysts say California’s regulators and lawmakers could take steps to extend similar protection in this year’s blazes. “It is our expectation that regulators will utilize the tools or framework outlined in S.B. 901 to address any potential 2018 wildfire-related costs,” Jeffrey Cassella, an analyst at Moody’s Investors Service, wrote in an email. Under the bill, utilities could sell bonds to cover their liability costs and pay them off over time through higher rates. PG&E estimates that the cost to the average consumer could be $5 a year for every $1 billion in bonds issued. Investors have been scrambling to assess the size of the financial hit that PG&E might suffer and whether the company had enough money to make it through the turbulence. The company said it had exhausted its revolving credit and raised concern about liquidity and cash flow. Some prominent investors may have been hit. Baupost Group, run by Seth A. Klarman, an investor with a reputation for spotting undervalued stocks, added more than 14 million PG&E shares to its holdings in the third quarter, according to securities filings, while Viking Global, the hedge fund of O. Andreas Halvorsen, bought 5.7 million shares. Baupost and Viking declined to comment. Although jarring, the move to draw down its credit lines gives the company a pool of funds that it can use to pay expenses and make debt repayments due in the coming months. Citigroup, Bank of America and JPMorgan Chase were among the banks that set up the credit lines, according a PG&E securities filing from 2015. The company said it had about $3.5 billion of cash after drawing down the credit lines. Last December, in anticipation of possible damage claims from that year’s wildfires, PG&E suspended dividend payments. Its stock has fallen sharply, but the company is still worth $13 billion.